We have detected that your have a popup blocker turned on. 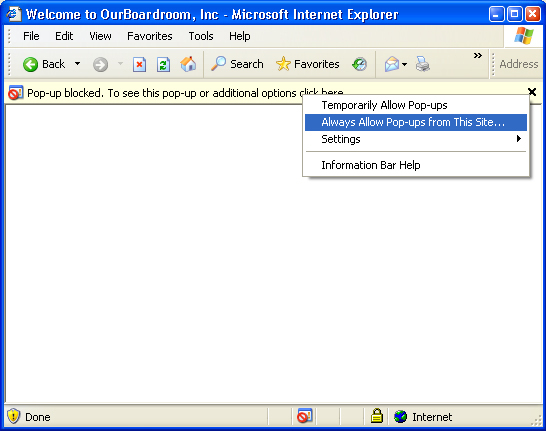 www.ourboardroom.com utilizes popups and is safe to add to your allowed sites list. If you are using Microsoft Internet Explorer please follow the following instructions to add OurBoardroom.com to your Allowed Sites. 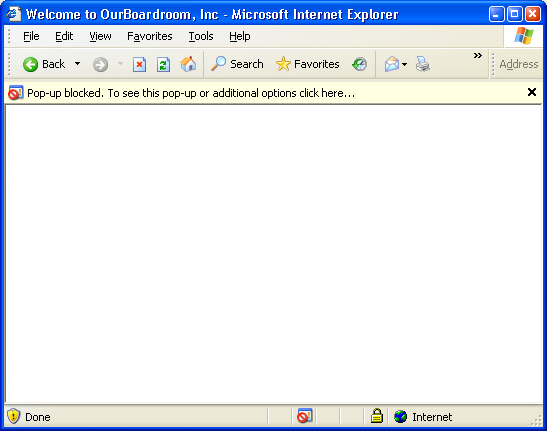 When you first attempt to visit www.ourboardroom.com with your popup blocker enabled you will see a yellow bar at the top of your browser. Below is an example. To add www.ourboardroom.com as one of your Allowed sites, right-click on the yellow bar at the top and choose "Always Allow Pop-ups from This Site". Below is an example. When you click on the "Always Allow Pop-ups from This Site" choice, you will be prompted with a confirmation box asking if you're sure you would like to allow pop-ups from www.ourboardroom.com. Select 'Yes'. Below is an example. After you've clicked 'Yes' you will sent to www.ourboardroom.com. If you have any questions, please don't hesitate to contact our support staff at support@ourboardroom.net.